Chesty Puller (center left) and Ironman Lee (center right) in Nicaragua, 1931. The Battle of Agua Carta, or the Battle of Lindo Lugar, was an engagement between the National Guard of Nicaragua and the rebels of Augusto César Sandino in 1932.:357–359 It was fought near Mount Kilambe at the Agua Carta, a river in Sandino territory, as part of the American occupation of Nicaragua and a long lasting civil war. 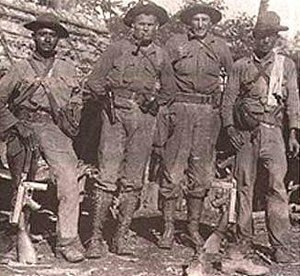 Following America's return to Nicaragua in 1926, the United States Marines took command of the Nicaraguan National Guard to fight Sandino's rebels and an occupation began which lasted for several years. A mounted patrol of forty guards under First Lieutenant Lewis "Chesty" Puller and Gunnery Sergeant William "Ironman" Lee headed north from Jinotega on September 1, 1932. Because both Puller and Lee were technically part of the National Guard, Puller assumed the rank of captain and Lee a first lieutenant. While about eighty to 100 miles from the city and just northeast of Kilambe the patrol found the Agua Carta and proceeded to cross it when the rebels attacked. Ambushes at river crossings were very common during the occupation so Captain Puller and his guards had no trouble in fending off the attack. When completely across the Marines and the guards found a main body of the enemy, positioned on a ridge, an estimated 150 men armed with seven automatic weapons and a number of bolt action rifles. The main engagement began with the rebel militia attempting to flank the guards but this attack was repulsed largely due to Lee's fire from his Lewis machine gun. Because of this Lee became a target and was one of the first men wounded by enemy fire. With two bullet wounds Lee managed to free his jammed machine gun and charge the ridge where he and a handful of other guards flanked from the left. Puller then advanced with the remaining men and flanked the rebels from the right and they were routed from the field. The battle was long and the rebels were found to have a large cache of ammunition available. Ten rebels were counted dead and at least ten others escaped wounded, of the guards two men were killed and four wounded. Captain Puller received his second Navy Cross of five and later became a general in the United States Marine Corps. First Lieutenant Lee survived and also received a Navy Cross. On the return to Jinotega, Puller's patrol was ambushed twice on September 30 and both attacks were repulsed with heavy losses on the rebel forces. ^ a b c "Lewis B. "Chesty" Puller : Date of birth: June 26, 1898 : Date of death: October 11, 1971". Militarytimes.com. Retrieved 2015-05-31. Alexander, H. Joseph; Don Horan (1999). The Battle History of the U.S. Marines: A Fellowship of Valor. Harper Collins Publishing. This page was last edited on 4 March 2019, at 03:03 (UTC).